UK Poker News continues its discussion with Ian "At-It" Bradley, the 22-years-old poker player from Teesside in North-East England who has made great progress in two short years since playing his first game of poker at a local £10 event. In this Part 2, Ian talks of his visit to Las Vegas in 2005, the unscheduled additions to his itinerary in the name of poker, and looks forward to what the future may hold for him. UKPN: Your poker career only goes back two years or so. You have come a long way in a short time, which has included a visit to the World Series of Poker in Las Vegas. Tell us more about that trip, whether you received sponsorship, the things you did, the big names you met or played against, and your overall impressions of that festival. IB: Yes it has been a bit of a whirlwind so far, I have achieved quite a bit in my short poker career so far, but I am hoping to gain a lot more success in the coming years! Las Vegas was a good part of last year and it certainly improved me as a player. The original plan was for me to go to Las Vegas with 4 of my friends, play one or two WSOP events and have a good time really. The plan changed slightly when on my first day in the Rio I won a seat for the Main Event! After some deliberation I decided that I would go home as planned then come back in a couple of weeks for the main event and a lot more poker. On the first trip, I played the $2,000 No Limit event and it was a shock to the system to be honest, not sure how to approach the event and I was out early. One of the highlights in the trip was watching a good friend, John Law, in the final of the $1,000 No Limit Rebuy event; he played brilliantly and was unlucky to come 2nd. That definitely got the buzz going and I was getting very excited for the Main Event. I did play some more poker on the first trip and won a couple of smaller tournaments, one at Binions, the home of poker, which was special. Knowing I was returning though made me take it easy, I enjoyed soaking up the atmosphere of the WSOP. For me it was my first time there and something very special. On the return journey there were a lot of poker players heading in search of the Holy Grail, and some got very close! For me it was an eye opener I think; in the Main Event itself I was playing great for most of the day, up with the chip leaders of the whole tournament and also had the table under control. About an hour from the end of play, things started to go wrong. I lost some chips, and a woman at the table called Carmel Petresco was now wiping out the table! She was in every pot, and often with the worst of it. At the last break I had mentioned to a few people that this lady would either make or break me! Well she broke me, and a lapse in concentration after 15 hours had cost me my shot at the Holy Grail. The experience taught me a lot though, and I learned so much. Probably more from going out than all the pots I had won in the day! After that there was still a lot of poker to play, whether it be the Bellagio, The Palms or anywhere else. I had 3 good results in The Palms summer series, including the last event of that which had 270+ runners and I came 3rd. A lot of the British players were staying at the Orleans and they told me about the $1,000 event taking place. So I headed over and in the end I won the event, it had a lot of great players in it including Julian Thew, Roland De Wolfe, Lawrence Gosney and many others. I played well, and it capped off the trip quite well. It was also another Charity event; you paid $50 dollars extra for double the chips. So I am also the "Oklahoma Johnny Hale No Limit Charity Champion", its starting to become a bit of a theme this! I wonder whether they can make the Main Event this year a charity tournament, I'd be odds-on favourite! The trip was great and I'm already planning this year! I did play some of the top Americans, Clonie Gowen, Erick Lindgren, Barry Greenstein and a few others but it did not affect my game; I was in a lot of pots with these three though in particular, and I enjoyed every minute of it. Playing these people just makes you want to get to their level and I think I am on my way! UKPN: You have a website called "At-It" which is one of your poker nicknames. For the benefit of our readers, can you enlarge on the origins of this nickname? IB: I wondered when we'd get to this... It's all Tony Kendall's fault! I first met him in Newcastle about a year and a half ago, before he was the famous man he is now! He was on my table in the £100 Pot Limit rebuy tourney and I proceeded to make him buy-in a fair few times, not always with the best of it I may add! I met him again a few more times, then I made the second day of a tournament in Luton and in the results on the Internet Tony had put me down as Ian 'At-iT' Bradley! I had no idea what "It" meant at this time, until he came over to explain what it was and to ensure me we'd find the culprit who named me! It has stuck since then really, and basically it means that I am always bluffing and trying to win all the pots! I certainly don't get much respect anymore from anyone who hears my nickname, but that's a good thing as well. UKPN: Where do you play most of your poker in England nowadays and how would you summarise a typical poker day in the life of Ian "At-It" Bradley? IB: At the moment I am playing a lot online, trying to improve some aspects of my game. I still try and go to local competitions as much as I can, and have recently been heading down to play at Leeds as my protégé, Chris, lives there. He is still struggling though as he always only thinks that he is a 2/1 underdog! So at the moment it would be, wake up, get ready then turn the laptop on and surf the online tables for the game that most appeals to me! It could be Omaha, cash tables or Texas tournaments, and that's the good thing about online, you can pick any game that takes your fancy. UKPN: Looking forward from here, would you say you have established in your own mind that you are good enough to make further progress in the poker world? If so, what do you see as your immediate and longer term goals? IB: In terms of my game I feel I still have a lot to learn, as I have been playing for a relatively short space of time. As I said earlier, whilst I respect the players I play against, I certainly believe that I can play with the best of them, and look forward to testing myself in the future. I think that I have had some good results but probably have not taken advantage of some of the great situations I have been in, in tournaments. In a short space of time, I have done quite well and being selected to be involved in the Unusual Suspects by Blue Square and John Rabb proved to me that people respect my game. Short term, I hope to play some more of the larger festivals this year, and head off to Las Vegas again for the summer. Hopefully I can pick up some more good results along the way. In the long term, I obviously would love to win a WSOP bracelet. I have a long way to go in my poker career, and I really think I can achieve this. Also I would like to build a career in other aspects of poker, I have recently started doing some work for Poker425 and I would like to build on that. I love all the different parts of poker and working within it would be brilliant. UKPN: In the poker world, there are numerous legendary names, but do you have a particular "hero" or someone you admire for their poker exploits or style? IB: I have not really based my game on anyone in particular, but I do like to pick bits and pieces out of people's games that I like. 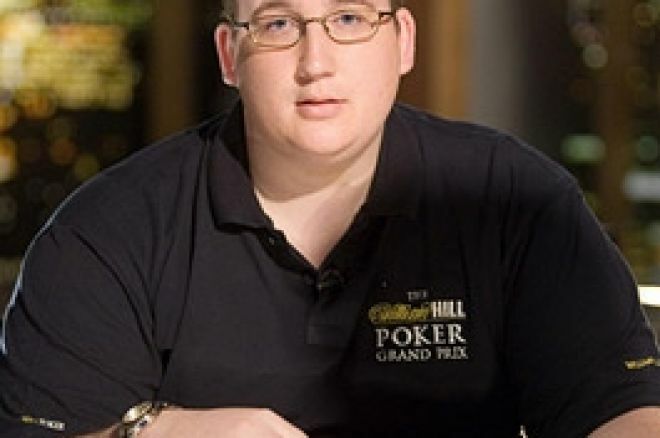 Early on I saw a programme with Phil Hellmuth in and he had said that he never tries to risk all his chips; small pot poker and I liked the idea of that. In the UK though I have met a lot of great people, and all of them have helped me in different ways, probably too many to mention. I love to talk about poker and it helps me when I talk things through with people. Words of advice are never far away from any of the veterans and it is always welcomed! Hopefully I can do the same in the future with some people. UKPN: Finally, Ian, to end with my usual question, what is your advice to a poker player who until now has played exclusively on-line but wants to try their hand at live tournaments? IB: Give it a go! It would depend on the type and on-line experience of the player but there are so many £10 buy-in competitions or £50 freezeouts in most casinos that there is something for everyone. The main thing is to go with the intention of having a good time and gaining experience, anything else is a bonus. Most places accommodate new players and so people shouldn't fear going for the first time, most players are willing to help with any of the issues people may be unsure of. UKPN: Ian, thanks very much for your time and UK Poker News wishes you every success in poker. Good luck! Ed note: Get a seat the WSOP main event for free with Titan Poker and UK Poker News.